A majority of voters who favor the Democratic candidate in their district (55%) say they are more enthusiastic about voting than usual, up sharply from 2010 and 2014. At about this point in 2006, when Democrats won majorities in both the House and Senate, somewhat fewer voters who backed the Democratic candidate (47%) said they were more enthusiastic about voting. Yet enthusiasm among Republican voters is almost as high; 50% of voters who prefer the GOP candidate say they are more enthusiastic than usual, which is comparable to the level of Republican enthusiasm in 2014 (45%) and 2010 (55%). And in 2006, just 30% of voters who favored the Republican candidate indicated they were more enthusiastic about voting. The survey finds that national political factors – views about partisan control of Congress and the president – are more important than in the past. Large majorities of voters who favor the Democratic (73%) and Republican (70%) candidates say the issue of which party controls Congress will be a factor in their vote. Again, the shares in both parties expressing this view are about as high as or higher than in recent midterm elections. 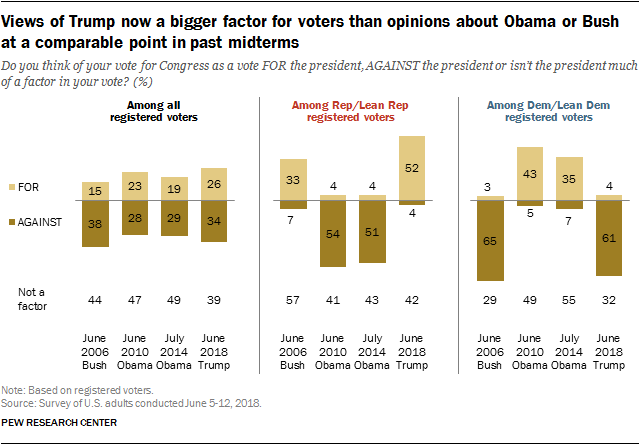 Trump is now a bigger negative factor in voting decisions for Democrats than Barack Obama was for Republicans during the midterm campaigns in 2010 and 2014. However, Trump also is much more of a positive factor for Republicans today than Obama was for Democrats in the previous two congressional elections. About six-in-ten Democratic and Democratic-leaning registered voters (61%) say they think of their vote as a vote against Trump; in June 2006, a comparable share of Democrats (65%) considered their midterm vote to be a vote against George W. Bush. In both 2010 and 2014, smaller shares of Republican voters thought of their vote as a vote against Obama (54% in 2010, 51% in 2014). Currently, 52% of Republican voters view their midterm vote as a vote for Trump, which is higher than the shares of Democrats who said this about Obama in 2010 (43%) and 2014 (35%), or the share of Republicans who saw their vote as being “for” Bush in 2006 (33%). Trump job approval steady. In the survey, which was mostly conducted before Trump’s June 12 summit meeting with North Korean leader Kim Jong Un, 40% of adults say they approve of Trump’s job performance, little changed from earlier this year. Majorities say Trump has little or no respect for the nation’s democratic institutions and traditions (60% say this) and express little or no confidence in Trump to keep his business interests separate from presidential decisions (56%). Majority has less trust in what Trump says compared with previous presidents. 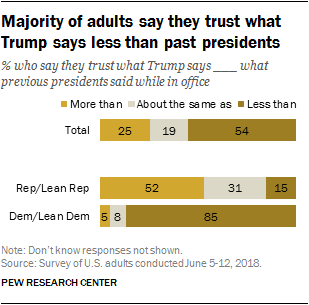 Overall, 54% say they trust what Trump says less than they trusted what previous presidents said when they were in office; just 25% say they trust Trump more than his predecessors, while 19% say they trust him about the same amount. About half of Republicans (52%) say they trust what Trump says more than previous presidents, compared with 5% of Democrats. Fewer Republicans express more trust in what Trump says than did so in April 2017 (66%); there has been little in change in Democrats’ views. Trump widely viewed as lacking respect for many groups. Asked about Trump’s level of respect for various groups in society, majorities say he has little or no respect for several groups, including Muslims (68%), immigrants (64%) and women (56%); in addition, 67% say he has minimal respect for people who voted for Hillary Clinton. Trump is widely viewed as having a great deal or fair amount of respect for white people (82%) and men (76%). What voters want candidates to discuss: immigration, health care. In an open-ended format, 19% of registered voters cite immigration as the issue they would most like candidates in their state or district to discuss, with 13% mentioning health care. While similar shares of Republican (21%) and Democratic voters (18%) say they would like candidates to address immigration, about twice as many Democrats (16%) as Republicans (8%) say the same about health care. 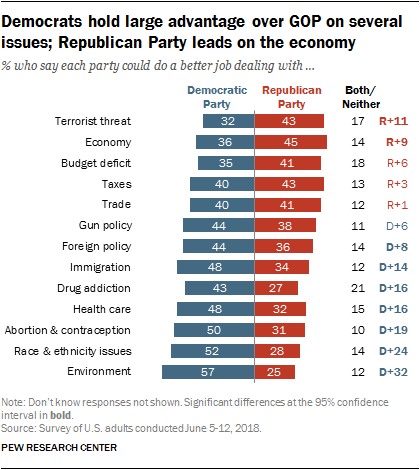 Democrats lead on several issues; GOP leads on economy. With the public’s views of the economy becoming more positive, the Republican Party holds a 45%-36% lead on dealing with the economy. Last October, the two parties were rated about even for handling the economy (38% Republican Party, 41% Democratic Party). The GOP once again has a significant lead on handling terrorism (43% to 32%); neither party had an advantage on terrorism in October. On many other issues, however, the Democrats hold wide advantages. On both health care and immigration – two of the issues that voters mention most often as what they would like candidates to discuss – Democrats lead by 16 points and 14 points, respectively. A wider gender gap among younger voters. Voting intentions for the midterm elections – and other political attitudes, including views of Trump – are deeply divided by education, age and gender. A 54% majority of women voters say they support or lean toward the Democratic candidate in their district, while 38% favor the Republican. Among men voters, by contrast, 49% favor the Republican, while 43% support the Democrat. The gender divide is much wider among younger voters – those under 35 – than among voters 35 and older. 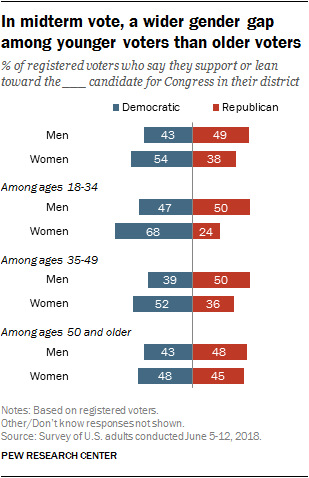 Women voters younger than 35 support the Democrat by an overwhelming margin (68% to 24%), while younger men are divided (47% favor the Democrat, 50% favor the Republican). The gender gap among voters ages 35 and older is more modest: 49% of older women favor the Democrat, as do 42% of older men.